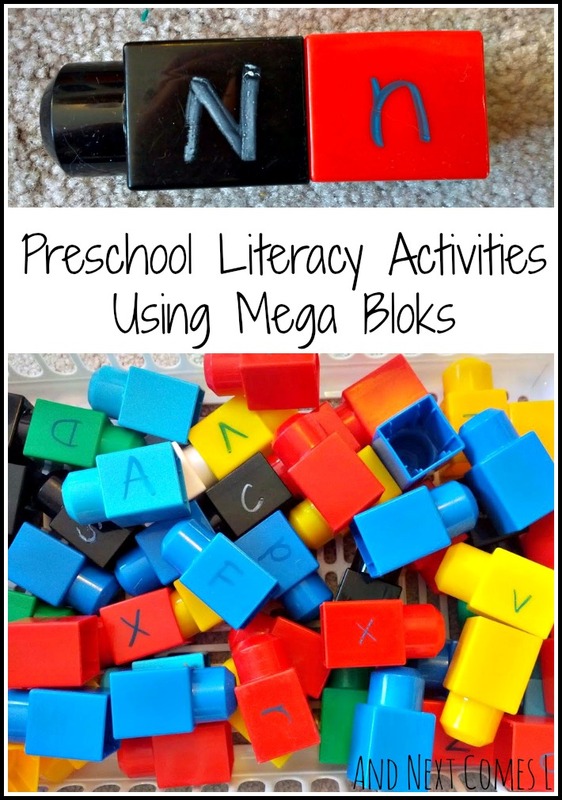 I came across the idea of using Mega Bloks to promote literacy from Preschool Powol Packets by using a dry erase marker to write letters on the blocks. 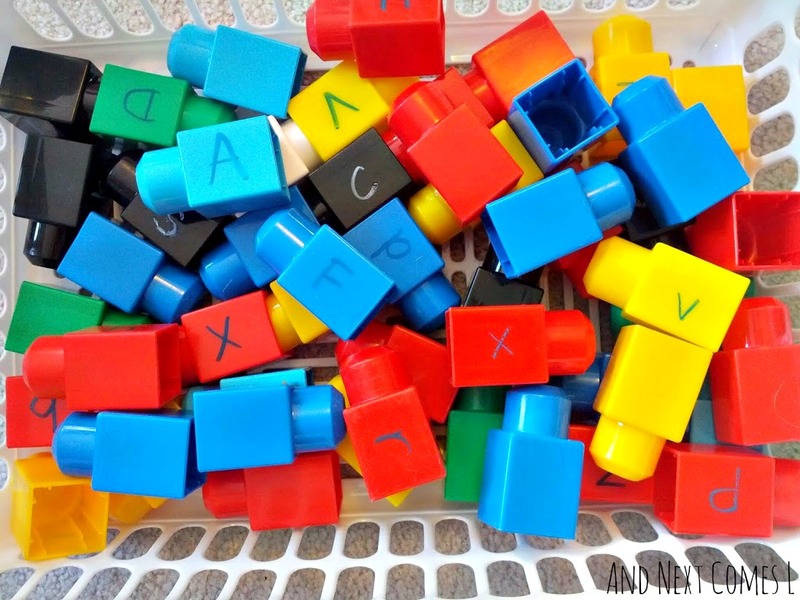 Of course, I started brainstorming other ways to use them, so here are five literacy activities for toddlers and preschoolers using Mega Bloks. I originally tried using dry erase markers, but I found that the letters rubbed off too easily. Instead, I used window markers. They dry quickly and don't rub off like the dry erase markers do. And after many hours, they still cleaned up super quick with just a damp cloth. I made 52 letter blocks so that I could have a full set of uppercase letters and a full set of lowercase letters. 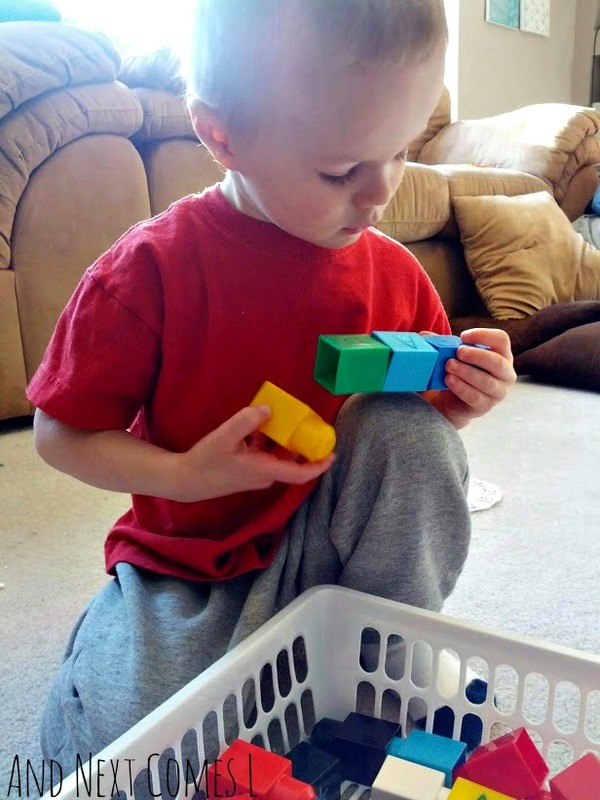 There are so many ways to play with these blocks, but here are a few ways in which the boys played. K was more interested in studying the letters and naming the ones he recognized. I helped him name the ones he didn't recognize. 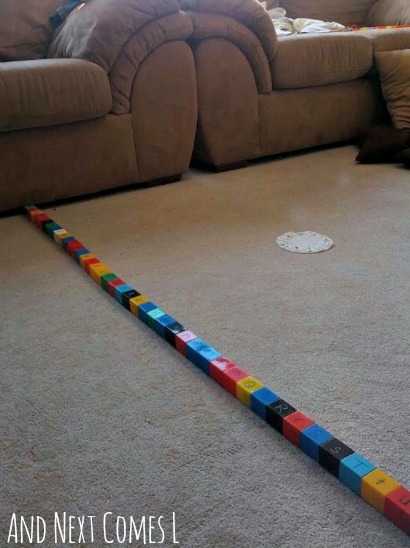 Then he started to build a tower. Then he dumped out the whole container. Since I made both uppercase and lowercase letters, we could do some letter matching. J tried this activity out for a bit and was, unsurprisingly, very good at it. He's been a pro at his letters for so long so this part was easy for him. 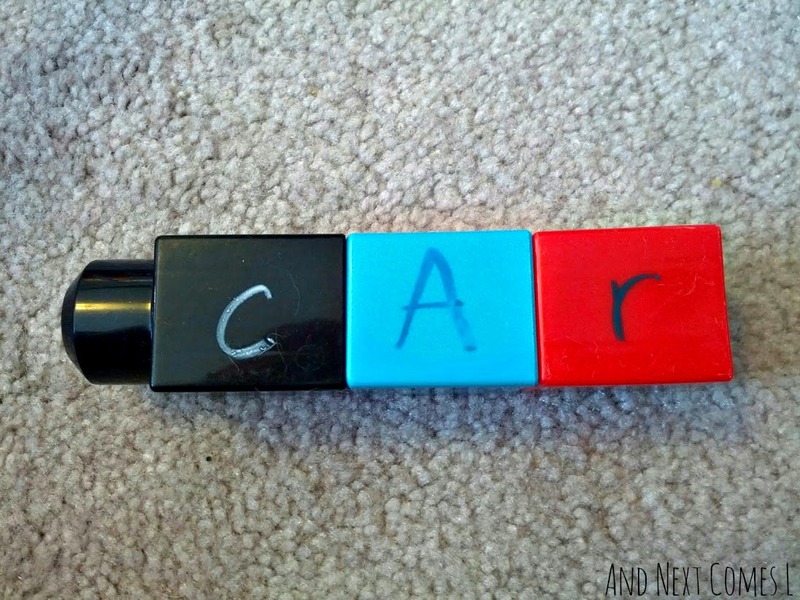 The blocks can also be put together to spell simple words to help your child practice their spelling and reading skills. It would be a great way to practice sight words too! 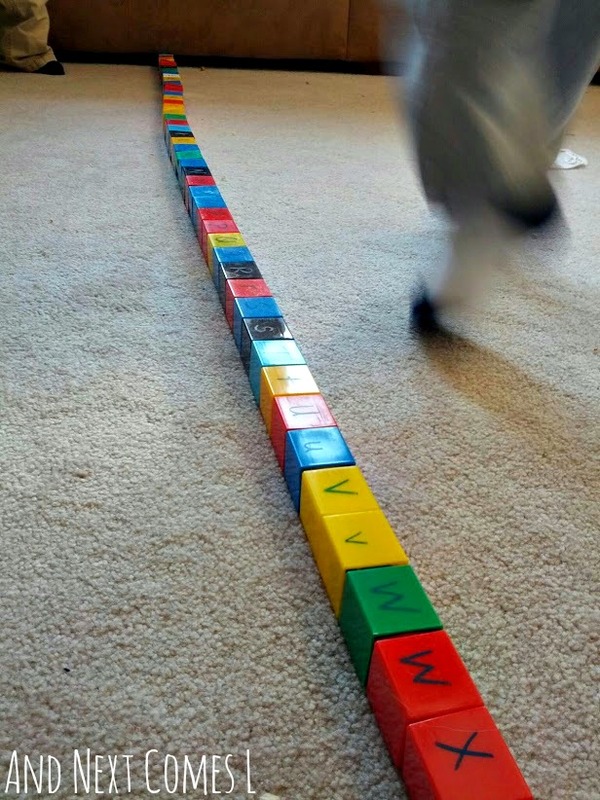 J started building a long line by putting the letter blocks in alphabetical order, uppercase then lowercase. Then J started running alongside his long line, singing the ABCs and pointing to the letters. 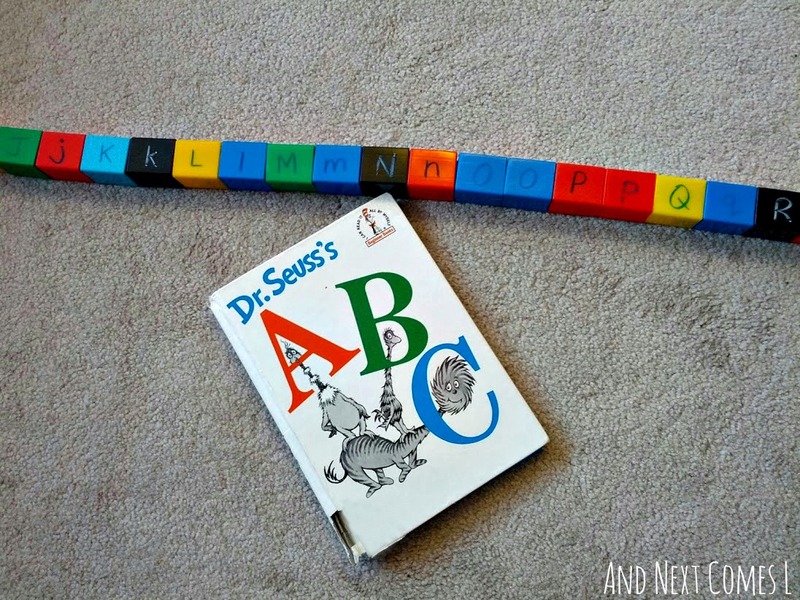 After J built his long line of letter blocks, I thought it would be fun to read our all time favorite ABC book. As you can see in the picture below, our copy of Dr. Seuss's ABC has seen better days. It has been read every single day for as long as I can remember and it is in rough shape now. Actually, when I picked up the book on this particular day, the cover slid right off. Regardless, we read the book together and J pointed to the correct letters as we went along. You could chose any of your favorite alphabet books, but we love this one. What's your favorite ABC book for children? Tell me in the comments. 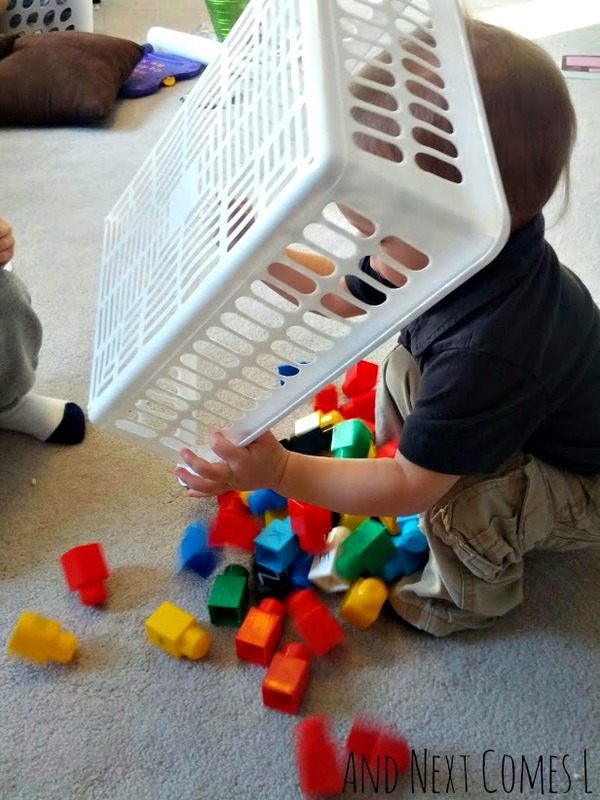 These are awesome leaning activities! I'm so glad you were able to run with the letters on blocks idea!! We didn't stop there! We did some number ones too (post to come). This is seriously cool! We are going to use them this week to practice building spelling words. Thanks for the idea! That's great to hear! Hope the kids enjoy it. I'm so glad to have found your blog. 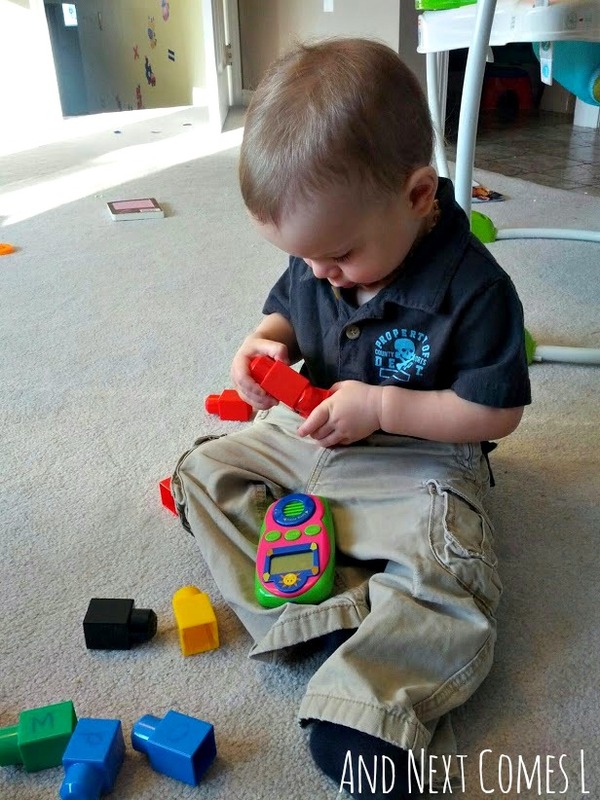 My son does basically the same things as yours. 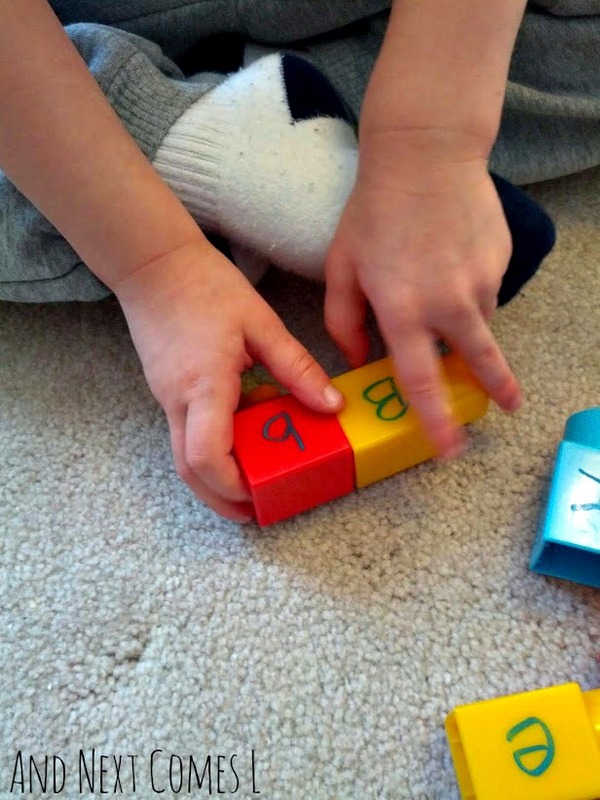 His favourite alphabet/number books are "chicka chicka boom boom" and "chicka chicka 1, 2, 3). 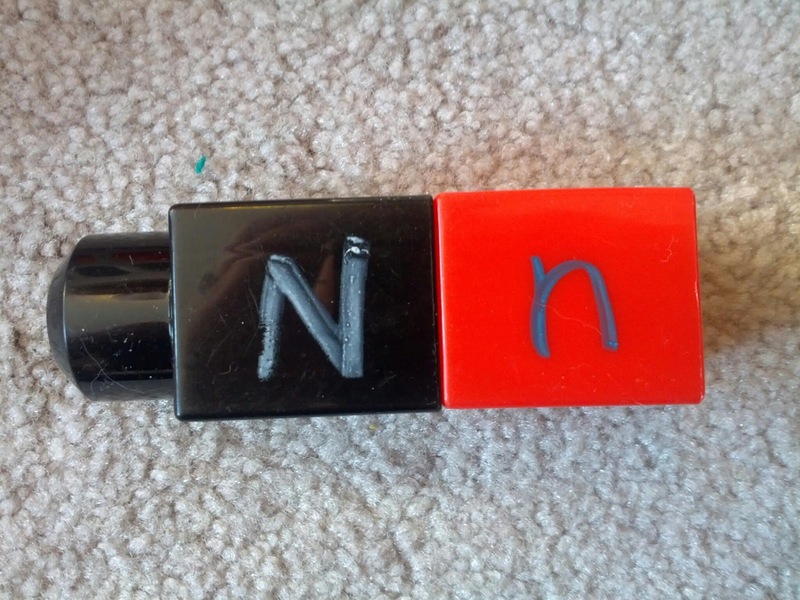 We often draw pictures on the marker board using letters and numbers (i.e. A can be a house, T can be a table, lowercase h can be chairs, r can be a waterspout etc) and have letters and numbers going up the coconut tree like the book.